Many people are still astonished by the fact that a man was able to stand next to President Obama at Nelson Mandela’s memorial and do fake sign language throughout this speech. What is equally astonishing that, even though the man was not really signing, no one seemed to catch on during the speech. This followed concern over the ability of South Africa to handle security for the President and other world leaders. South Africa failed miserably. It now turns out that it not only allowed a perfect stranger and fake sign interpreter to stand near Obama but Thamsanqa Jantjie has said that he becomes violent “a lot” and was hallucinating during the event. Thamsanqa Jantjie still insists that he was paid $85 to sign at the even by an undisclosed company. He then gave a description that will only deepen the problem for the secret service and the embarrassment of the South African government: “What happened that day, I see angels come to the stadium … I start realizing that the problem is here. And the problem, I don’t know the attack of this problem, how will it come. Sometimes I get violent on that place. Sometimes I will see things chasing me.” Great. By the way, Jantjie said that, after the ceremony, he had an appointment to get his regular six-month mental health checkup to determine if he could continue on medication or whether he needed to be kept at a mental health facility for treatment. Who’s hallucinating…… I won’t speculate the harm that will come to him…. The fact that this fellow was permitted to do his stage act next to President Obama is no more reflective on the President than the Benghazi killings were. Just as finding and employing a (fake) sign-language interpreter was the responsibility of the South African government, embassy and consular security is a host nation responsibility as well. That guy would make a good third base coach. A US President of the previous century said that the secret of leadership was to surround himself with people who were smarter than he was. It’s quite apt that this man was allowed to stand next to Obama. It would be interesting to know if one of our much vaunted security agencies had collected the interpreter’s name and any info on him prior to the President being put three feet from him, a potentially dangerous schizophrenic, and if so what was done with that information. And Len wins the Internet. All over the world, thousands of people were waiting to steal second base. Ron: Which State? South Africa? State of Arizona? State Department? State Penn? It was a mistake for any head of state to go there and risk their lives, our fortunes and someone’s sacred honor. Do we need more evidence that the State is inefficient if not wholy incompetent ? Was the secret service “busy” again? Everyone is very lucky no harm came to President Obama and all the other dignitaries within this guy’s reach. And looking at it, it is hard to think he is doing interpreting. My guess is people were too caught up in the moment to process what he was (not) doing. This is very bad. One would have thought the gov’t there could have saved much embarassment to them and the security of the speakers simply by hiring a sign language interpreter from somewhere within a gov’t agency that has one on staff. 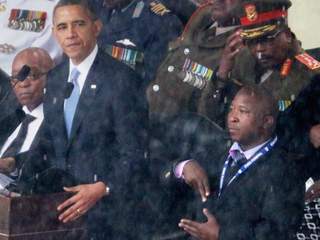 When this story of a fake interpreter first broke I assumed he was a security or body guard for the speakers. This is so bizarre. Maybe I have been giving to much credit to the world wide security state that has been created. Soooo, that’s the reason. Who wouldn’t be speechless if they saw and angel? I thought I was at the duffelblog when I first read this.